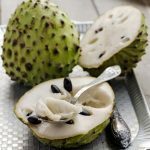 The cherimoya fruit, also known as chirimoya or sugar apple is a fruit belonging to the species Annona cherimola which is native to South and Central America. This fruit is also known as ‘the tree of ice cream’ due to its creamy consistency and a blend of banana, mango, strawberry, coconut, papaya and pineapple flavors. Thus, it is commonly used in smoothies and ice creams, added to fruit salads or even used as a mousse or pie filling. This juicy, delicious and creamy fruit resembles custard apple with its green outer skin consisting of overlapping scales and custardy flesh with several black seeds. The only difference is that it is much smoother on the outside, has comparatively lesser seeds and more flesh and is somewhat sweeter in taste. In fact, it is a variety of custard apple. The inner flesh of this fruit starts turning brown as it ripens and so it cannot be stored for a long time as the sugars in the flesh will begin to ferment. The seeds and skin are inedible as they are extremely toxic. This fruit finds its place amongst the healthiest fruits with its high nutrition, particularly vitamin C and antioxidants. Cherimoya is an excellent source of vitamin C providing around 1/5th of the daily recommended value. In addition to these, it is a very good source of carbohydrates, potassium, fiber, several essential vitamins and minerals besides being free of cholesterol and saturated fat and low in sodium. Thus, it offers several health benefits. 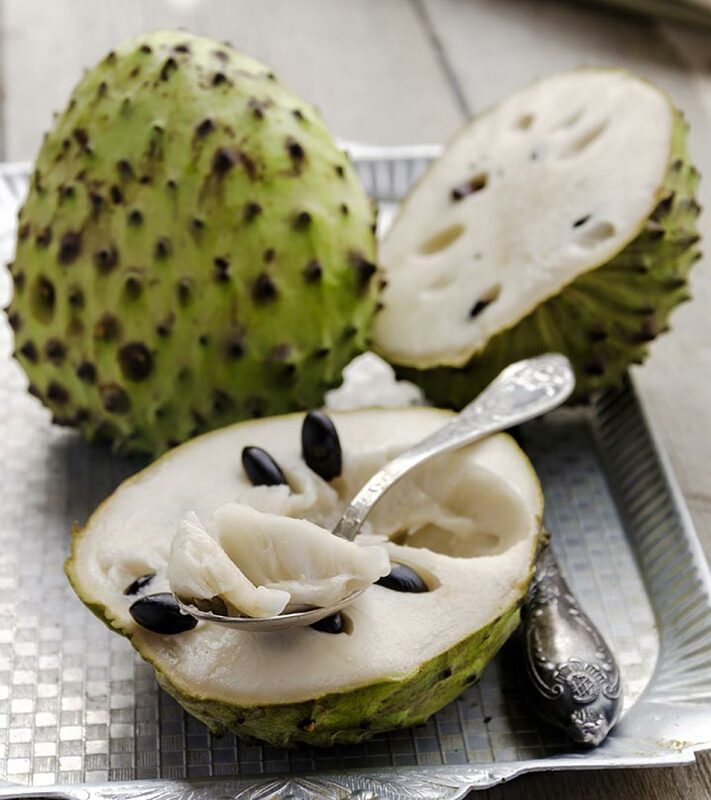 Cherimoya is rich in vitamin C which plays an important role in improving the immune system function. This nutrient is a powerful natural antioxidant that helps the body develop resistance against infectious agents and eliminates harmful free radicals from the body. Thus, it provides immunity against common diseases like cold and flu as well as prevents infections. Cherimoya has a high content of vitamin C, a powerful antioxidant that helps to protect the body from damage by inflammatory free radicals. The well balanced ratio of sodium and potassium in cherimoya helps in the regulation of blood pressure levels and heart rate. Moreover, consumption of cherimoya has proven to reduce bad cholesterol (LDL) and increase good cholesterol (HDL) level in the blood. Hence, it improves blood flow towards the heart, providing protection against heart attack, stroke and hypertension. The rich antioxidant content in cherimoya provides this fruit with anti-cancer benefits. Cancer cells are formed due to free radicals produced by oxidative stress. These antioxidants neutralize the effect of free radicals. Moreover, cherimoya contains significant amounts of dietary fiber which prevents absorption of cholesterol in the gut and prevents the mucus membrane of the colon from exposure to toxic substances, thus reducing the risk of colon and liver cancers. It also provides protection against breast cancer. Cherimoya fruit is a good source of B vitamins, particularly vitamin B6 (pyridoxine) which controls the GABA neuro chemical levels in your brain. Adequate GABA levels calm down irritability, depression and headache ailments. Vitamin B6 also protects against Parkinson’s disease as well as relieves stress and tension. 100 grams of cherimoya fruit contains around 0.527 mg or 20 % of daily recommended levels of vitamin B6. Cherimoya fruit contains calcium which is vital for bone health. In this way, it helps in preventing osteoporosis. Cherimoya fruit provides cytoprotective benefits to your body as well. The cherimoya fruit extracts enhance the survival of cells in your system by decreasing the release of lactate dehydrogenase or LDH from your body. High levels of LDH indicate that the cell has been damaged by injury or disease. Cherimoya contains abundant amounts of potassium which is required for a normal heartbeat and blood pressure as well as protects from hypertension and stroke. It also supports your metabolism and bowel movement by getting enough fiber. Besides potassium, cherimoya also contains other minerals like magnesium, sodium, zinc and manganese. This fruit is devoid of saturated fat and cholesterol and low in sodium. Cherimoya contains several polyphenolic antioxidants, the most prominent being annonaceous acetogenins. Compounds of Acetogenin are powerful cytotoxins possessing anti-cancer, anti-malarial and anti-helminthes properties. It is rich in vitamin C which acts as a natural antioxidant by protecting against free radicals. Being rich in nutrients, vitamins, minerals and antioxidants, this fruit can help in curing diseases such as decalcifications, diabetes, stomach contractions, constipation, intestinal transit problems, anemia, hypertension, stomach cramps and other related problems. Being a great combination of delicious creamy taste and a favorable nutritional profile, cherimoya fruit is beneficial for your skin as well. As stated earlier, cherimoya fruit has a high content of vitamin C which is vital for maintaining a healthy and glowing skin. Being a natural antioxidant, vitamin C helps in healing wounds and making collagen which is necessary for forming your skin. Signs of aging such as fine lines and wrinkles as well as pigmentation are a result of damage caused to your skin by the action of free radicals. Vitamin C in cherimoya can combat the free radicals from the body, thus providing healthy and flawless skin. Hair problems have become a cause of concern these days and can be attributed to the deficiency of essential nutrients and minerals. Since cherimoya fruit is highly nutritious, it can be beneficial for your hair in the following ways. Just like the skin, vitamin C is also vital for hair health and it prevents damage by free radicals which affect your hair as well. The unripe cherimoya fruit can be dried and powdered. This can be applied on hair for getting rid of lice. Hope you liked the article. 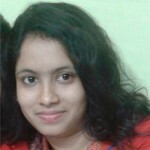 Please leave us a comment.